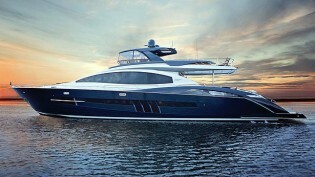 Florida Yacht Charter aboard LSX92 motor yacht ALGORYTHM – Superyachts News, Luxury Yachts, Charter & Yachts for Sale. Experience an unforgettable Florida yacht charter vacation aboard the striking and luxurious LSX92 motor yacht ALGORYTHM, cruising some of the most beautiful destination of Florida. Superyacht ALGORYTHM is available with K23 Yacht Charters in such popular America yacht vacation destinations as the Bahamas, Saint Petersburg, Destin, Useppa Island, Key West or the Cabbage Key. Luxury charter yacht Algorythm belongs to the LSX 92 series by Lazzara and accommodates up to eight charter guests overnight in four spacious staterooms. The professional and friendly crew of four will make sure your stay aboard exceeds all of your expectations. Powered by four super-efficient Volvo IPS engines, her fuel economy is unsurpassed in the industry. Algorythm superyacht is a custom-built vessel, specifically designed with luxury in mind. Her special features include the extended sundeck that creates a shaded welcome area on the aft deck; while the flybridge has been extended by 300%, creating an atmosphere of living on all levels of the yacht and features a hot tub for 2! The spacious outdoor deck aboard luxury yacht ALGORYTHM offers a fantastic area for sunbathing. In addition, the helm was removed from the main deck which extended the main salon for more living area. Based on the Manatee River in Bradenton, Florida, Algorythm is the only 92′ luxury yacht available for Gulf Coast yacht vacations. With a cruising speed of 25 kts the 900 horsepower Volvo engine she glides over the water for a smooth ride. The state of the art design features a hand-laid, “Vacuum bagged ‘unidirectional fibreglass with balsa cored hull and a hand laid, “vacuum bagged” E-glass and graphite balsa cored deck – one mould piece. She also features the best in electronics including a 64-channel ISIS 500 vessel monitoring system. Five LED flatscreen televisions including a 60” with surround sound. Four luxurious staterooms include a master suite with a king sized bed. Three spacious bathrooms with double sinks and all the amenities of home are located throughout the Algorythm yacht. A full kitchen, dining space, relaxing leather furniture offers seating areas with expansive views. There are laundry facilities and completely separate quarters for crew members. A gateway to Florida Keys and the Bahamas, Florida yacht holidays are represented by a vast wonderland of cruising destinations, secluded beaches, lovely sea-side towns, exceptional marina facilities as well as dream-like anchorages. St. Petersburg, Destin, Useppa Island, Key West and the Cabbage Key are some fo the most popular and beautiful places to charter this yacht, offering both quiet cruising by day and exciting night-life by night. Algorythm, available through K23 Yacht Charter, is a great choice when it comes to family vacations, or holidays with friends, as well as corporate events, weddings and special celebrations.